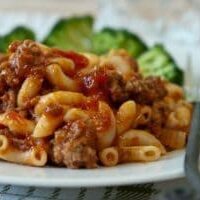 One-Pot Beef Goulash is a combination of ground beef, macaroni, pasta sauce, and cheese. Stir together. Add catsup and Sriracha sauce for some of the simplest and most delicious comfort food you can imagine. It’s not my mother-in-law’s goulash, rest her soul. I could be wrong about this, and I can no longer verify it with her, but I think her recipe went something like this. First: Boil the macaroni and drain it. Second: Add browned ground beef and maybe some onions? 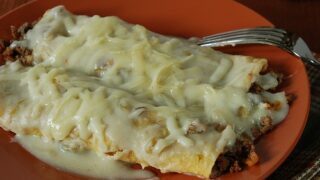 Third: Drown the whole mess with a bottle of catsup and add a lot of cheddar cheese. Finally: Stir it up good. What does this have to do with Chop Suey? When I recently saw a recipe for “American Chop Suey” in Cook’s Illustrated, I was puzzled by the title. Never before had I heard a mixture of beef, tomatoes, sauce, and macaroni called “Chop Suey.” Sounds Chinese, doesn’t it? Nevertheless, I recognized the food in the picture as a first cousin to my husband’s beloved goulash, so I immediately set out to gather the ingredients. Red bell peppers stood in for the green peppers. Substituted pasta sauce for the tomato sauce. Added some Parmesan cheese. Cheddar would taste good, too. After making the above modifications, something was still missing. My first thought was….ketchup. Yep! Sure enough, a couple of glugs of ketchup dumped into this One-Pot Beef Goulash added some sauciness and a touch of sweetness. Along with ketchup, this One-Pot Beef Goulash needed one more thing. Some spunkiness. A few drops of Sriracha was the perfect antidote. Eating Beef Goulash brings back so many memories for us. Maybe this recipe will be the beginning of new memories at your house. Boil pasta in salted water for 3 minutes. Drain, rinse with cold water, and set aside. Brown ground beef. Season with salt and pepper. Drain off excess grease. Remove from pan and set aside. Saute onion, bell pepper, and celery in same pan until softened and lightly browned. Add tomato paste and stir, continuing to cook for about 2 minutes. Add garlic and red pepper flakes along with tomato sauce, tomatoes, water, and cooked ground beef. Simmer until vegetables are tender, 15-20 minutes. Remove from heat, stir in macaroni, cover and allow to sit about 10 minutes. Season with salt and pepper. Garnish with additional Parmesan if desired. 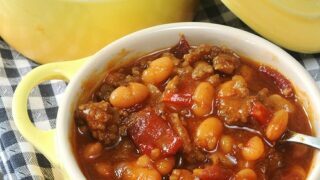 Well-seasoned baked beans are taken to a new level with the addition of ground beef and hot sausage. Previous Post: « Is a Plastic Knife a Substitute for Vacuum-Packing Lettuce? This is becoming a forgotten dish sadly! I grew up on this (before hamburger helper found it’s way into my single mother’s hands, lol)…anyway, I have never tried to make it, but would like to try one day. Mostly because my last name is Losch, and oftentimes people have a hard time pronouncing it, so i always say, “It’s like goulash, without the ‘goo,’ ” which up until recently went over well. Now when I say it people just smile awkwardly sometimes. I started asking, and many people have NEVER even heard of it…imagine that! I’m going to be 27 this year, so I know it’s not that old…or is it? lol… Anyway, thanks for posting! Goulash is definitely not old. The name maybe, but the dish itself is a classic. Right? I was thinking about this simple American/Italian dish and wondered what you all grew up calling it? 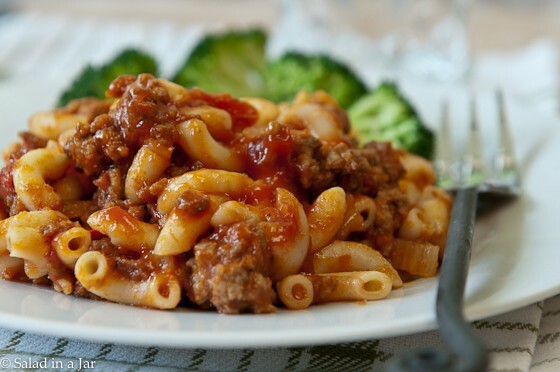 In south Jersey we called it American Goulash (or just goulash–small “g”-really not sure how the Hungarians figure in there), in school they called it Beef-a-Roni (which I thought was made by Chef Boy-Ar-Dee and came in a can…), but my husband’s Boston family calls it American Chop Suey (which makes NO sense to me at all!) So what do you call elbow macaroni in tomato sauce with ground beef and chunks of tomatoes and onions (and sometimes green peppers, or in the case of my school lunches chopped bacon pieces…)? This to me is the ultimate “comfort-food”.I get the “chop suey” or “goulash” thing being a thrown together kind of random left-overs type of dish—however this is not random. It is made with as much care and planning as most any pasta dinner, so I don’t understand that inference either. I never had it with ketchup (is catsup also a regional thing?) but my mother always put a spoonful in her sauce (which my husband’s family call “gravy” even if it is made of tomatoes) instead of the sugar most other mothers I knew used. You might try it with the bacon pieces like my school lunch-ladies did–it gives it a sweet tang. Yes Ravyn, I can imagine bacon would be a wonderful addition! Thanks for the suggestion. I’ve spent the last 15 or so years trying to find my mother’s recipe for her goulash. We couldn’t get enough of it when I was a kid. I just stumbled on yours and couldn’t believe just how close it was to hers. However, she used a loaf of bread and a lot of tomato paste in hers and she did it in a 12 qt stock pot. The rest seemed basically the same so I tried it. A couple of variations such as an xtra 1/2 cup of water and 2 large cans tomato paste and…….PERFECTION. It was exactly what she used to make. I had tears in my eyes the first time I tried it. It brought back the days when we came home to a hardy bowl of Mom’s goulash. I can’t thank you enough. Peace be with you and thank you very much. This is such a comfort dish for me. My Grandma used to make this, something between this and your mother-in-law’s recipe. It was simple and fantastic. My Mom always went to exotic and ethnic extremes (weird in the 70’s) but Grandma always made this and it was just what we wanted. I need to do this. THIS is goulash to ME! Paula, I didn’t know the name of this but this is what my mother in law makes all the time, but she throws in peas but no other vegetables. I can’t even say that I tired hers since I was a vegetarian for many years, but your recipe def. seems much healthier than the ketchup version or the no veggie version :). I’ve been fixing my salad in a jar ever since I saw your post and it has been just great until the last few times. I’ve been getting brown edges after less than a week – top is tight and well sealed. Any suggestions? There were a couple pieces of chard in this jar – do you think that would have made a difference? When I taught school, this was standard fare in the school cafeteria. I always gobbled it up (it was a small town and those ladies could cook!). I think they may have used tomato soup . . .
My mother in law makes something similar and calls it slum gum. My mom also had a version that used tomato soup. What memories! 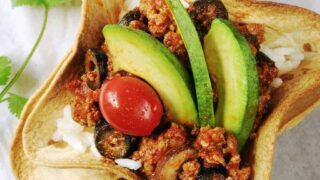 Nice sharing of recipe..I cant wait to try this..Thanks for sharing with us..
My father in law makes something very similar to this, it’s so yummy! My mama used to make this and I loved it! Thanks for the blast from the past! Thanks for the recipe..I really appreciate this recipe..I cant wait to taste it..Hope you can share more.. Sometimes all you need is a little catsup…or a bbq sauce…or yes, Hot Chili Sauce! I had Goulash alot when I was little, and loved it! Love your recipe! thanks so much for sharing! My family made this with stewed tomatoes and called it goulash. 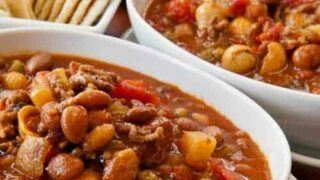 Later on, I lived with a Hungarian (who escaped during the ’56 Revolution) and discovered that REAL goulash was really a stew made with dried beef and little else – no macaroni, or cheese, or much beyond paprika – which is dried sweet or hot red peppers – and probably onions or garlic. 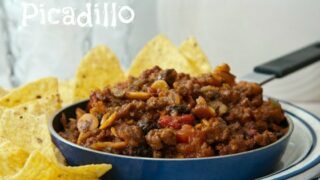 I discovered that some people call it Chili-Mac – which is more suggestive of its ingredients. As an extension educator I used to teach folks to use the same ingredients in a single pan (Yes, a one-pot meal) and it became “skillet lasagna” and it worked pretty well. 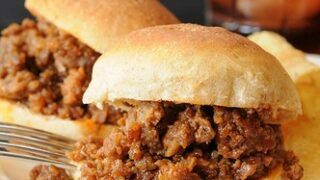 People sometimes substituted other meats – like venison – for the ground beef and a can of spaghetti sauce was easier for some than straight tomato sauce. You browned the meat and onions, poured on the sauce and some extra water, dumped in the pasta, covered the pan over low heat and cooked it covered for as long as it took to make the pasta tender. 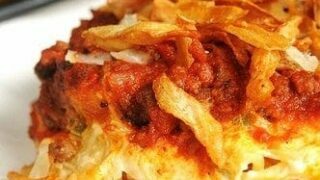 This is the original hamburger helper recipe and how it got to be called goulash is beyond me – but it still works and still tastes just fine. Very interesting Nancy. I knew that my goulash not Hungarian since it has no paprika but didn’t know about the red peppers. What we used to call Chili-Mac had chili powder in it. 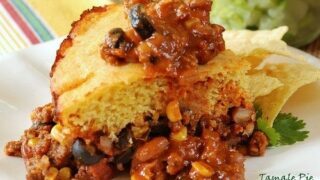 My sister once made Chili-Mac for her boyfriend when he asked for chili. He was astonished to find macaroni in his chili. Paula, who else could make goulash look so delicious!? I didn’t think I liked it but I just changed my mind! Love this photo! I know three little people (and two other people ☺) that would love this! I ditto your 2. substitution. It is standard in my house as well. My dad made this growing up and wished I had his recipe. Yours looks delicious and I can’t wait to try it. Thanks Paula!! 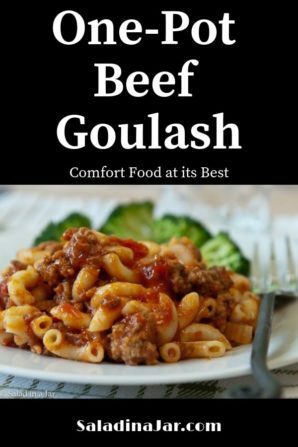 Sounds like goulash is comfort food for you too. If you try it, hope it brings back lots of good memories. Hi Paula! My kids grew up on this and my in-laws had it at every back yard cook-out. But, it has been YEARS since I made it and clear forgot about it. Wow – look at that yummy photo! I can almost taste it : ) I’ll pass on the Hot Chili Sauce but will add the catsup. That is how my mother-in-law pronounced it too. We say ketchup.